One little bit of good bee news. This started out as a comment over at The Crusty Chicken; but it kept growing, and got to comment-clogging proportions. So I moved it here. Basically, Ruchi sent out a plea for some good news to cheer her up; things looking just a tad depressing out there these days. We are, indeed, scrod, in many ways. But, Ruchi, I do have a very nice piece of happy news for you (and I suppose everybody else, too.) I haven't written about this event elsewhere, been kind of saving it up. Like any orchardist, I've watched the bees every year. Most years for the last 20, my apple trees have been full of wild European honeybees; many many thousands. It depends on the day, of course; on a calm, warm, sunny day, the bees are hard at work. If it's cold, windy, and cloudy- they may still be there, but in much lower numbers- if the whole flowering season is stormy, apple orchardists worry about poor pollination cutting the crop. Last year, on a coolish but calm and sunny day, with the orchard in full bloom- I watched 4 apple trees, for about 15 minutes, and couldn't find a single bee- of any kind. Not only no honeybees, but no bumblebees (we have about 5 species, I think); no carpenter bees, and none of the tiny wild ones that you overlook when the tree is buzzing. Not one bee. Not even a bee-fly. That got me pretty worried. We've had other years where the honeybees were down- but the wild bees were always abundant. From 2003-2006, we'd let a beekeeper place around 10 hives on the farm; he got basswood and clover honey; we got a little honey for ourselves, and the apples were loaded with bees. But in 2007, he couldn't afford the gas for the travel anymore, and pulled his hives. I made a point of looking the next day. No bees. Understand, now- I was really looking hard for any bee. And finding- zero. I'd never had that happen before, in 20 years. And I looked the next day. On the third day, I did see a couple bumblebees, and one of the tiny ones. In 15 or 20 minutes of searching- an abysmally low number of pollinators. At that point I got distracted by some emergency or other, and was not able to keep tracking the bee behavior in the apples. I was pretty sure we were going to be toast, crop-wise. For most of the spring, I was not figuring on the apples for any real food, or money that year. I thought there'd be a few apples; but nothing like a crop. And- I was wrong. We had a huge apple crop; maybe our biggest, though it's hard to compare them, because our 30 year old standard trees are still dramatically increasing their yield, year by year. This is one of our Golden Russet trees, in 2007; in 2008, the crop was much heavier, probably at least double. Somehow, Ruchi, the apples got pollinated. My strong belief is it was the wild bees, and other insects; they just weren't flying on the 3 days I looked, but somewhere in the week and a bit pollination window, they must have had a day they liked, and they got the work done- just fine. At present, wild bee populations are too small, too few and too far between to take on the task of pollinating our crops. That, of course, is why fleets of domestic honeybee hives must be trucked in to do the job. But if the wild bees were provided with habitat of the right kind and in the right geographic arrangement, they could achieve pollination both reliably and effectively. You may notice that the writer is excessively pessimistic - on all points. At least here- where we use no pesticides, and always keep habitat diversity and complexity high, as a matter of good practice. A good part of the lesson, I think, is that the mainstream media is now in a doom feeding frenzy- it's the trend. So where they were all denying doom 6 months ago; now they all want to be in the forefront; and have a slight tendency to expand the doom quotient in their stories now. Nature can find a way- if we let it. A photon saved is a photon earned. We're in the segment of the year when our house energy balance is always very, very tight. The discussions there are well worth reading- and actually, I don't think La Crunch and I disagree, in the end- it's more a matter of I was talking generalities, as in "for most families in the First World..." and she was talking "in MY household..." Yes, by golly, if your Kitchen Boss is also Obsessive/Compulsive, you can use a refrigerator in a useful, non-wasteful fashion. Many homes are not so lucky, however, and quite few refrigerators have operators on the other end of the "careful" scale. Sure, Crunch, you do very well with your fridge- though I still want to see your ACTUAL energy consumption numbers- measured by a Kill-a-Watt or something, like Sharon uses. I can just SEE you, standing in front of the open door of your EnergyStar fridge- and planning stuff- 8 times a day, for minutes at a time... :-p And how many times a day do the kids and hubby open the door? Hm? What the maker promises, and what you actually use, are not the same thing atall atall. And, incidentally, the Inspector General of the EPA has just (Dec. 17) issued a report: industry scam on the Energy Star program. Guess what? It ain't all they say it is. One clue- it's a program run by- the appliance industry (largely started so they could avoid real government regulation by showing "voluntary industry compliance" - but don't say that out loud). In any case, fridges are not the only piece of the energy equation, by a long shot. While I hope to do a "fridgeless" update in the near future, at the moment I want to concentrate on some aspects of being off the grid. Winter changes what is going on with your solar panels- unless you live on the equator. The usual situation at higher latitudes is; you get weaker sunlight, because it has to filter through more atmosphere at lower angles; you get fewer hours per day; many winter months tend to be more cloudy (though not all locations are the same). At the same time, however, the panels themselves put out 1% more power for ever 3°C colder- which can mean a LOT on a -20° sunny day, like 20% more current than rated for (boiled my batteries, first year). Over all; you have less power available in the winter; though it's not as bad as most expect. And you have to include the effect on your system batteries; we've got only 4 lead-acid golf cart batteries, quite a small bank. One of the management requirements for lead-acid batteries is they need to be "topped up" regularly; once a week at least, you need to push them to full charge. It's really hard to do that using panels alone in the winter. So- if you're like most off-gridders, you do have a backup generator. We have TWO! Just so you know. Ok, 5; but 3 of them are broken. The broken ones are older, the working ones are state-of-the-art, and carefully maintained. Your goal, as an obsessive/compulsive home electric system manager, is to have to buy as little gasoline (house) or diesel (greenhouse) as possible. So you really do want to get every last photon captured that you possibly can. Every photon makes a difference. At this point, in the Little House, we're missing a lot of winter photons; partly due to design compromises discussed previously here, and partly due to the passage of time, with some unanticipated consequences. If you'll look closely at the photo above (and I hope to heck that you can click on it and get a bigger view- sometimes Blogger does that, and sometimes not, and I haven't figured out why, and they're not telling) you'll see that the panels are shaded by tree branches (the trees are 200' away, but the sun is low) and, the panels are covered with frost, greatly reducing the input. The frost comes from- the chimney. The "smoke" you see there isn't smoke at all; it's steam. When we have temperatures below 0°F day after day, the woodstove is actually burning very hot and clean most of the time. But water is the other product of combustion, along with CO2; and under the right conditions, it will form frost on anything in what is normally the smoke path. This was one of those days; and it was so cold the frost didn't melt off until almost noon, costing us a big chunk of the daily photon budget. Frost on the panels from the chimney is a compromise I knew about at the start- the position of the panels on the roof was determined by many things, including access for maintenance. It ain't perfect. I was also worried we might get smoke deposits on the glass panels; but in reality it's never been a problem; a good rainstorm every once in a while works fine. I actually went up there and cleaned the panels with Windex every month for the first year- at which point I decided it wasn't worth while. Biggest bang I got was in the spring, during oak pollination. Some days, the oak pollen blocks more sun than the frost ever does. An unexpected, and unbudgeted electric load for the system to carry. This is a "nebulizer", which the doctor prescribed for Smidgen in the middle of our fight with upper respiratory bugaboos. Doc examined her and said she was on the edge of bronchitis and or pneumonia; the medication inhaled from this thingy opens up the air passages, and helps stave all that off. It seems to be working. It has a powerful little air compressor that drives the mist-making device; Smidgen has to sit in this delight for a half hour, four times a day. And it's noisy. You can't eat, drink, draw, read, or play with it on; so we've bent one of our rules and allow her to watch DVD's on one of the computers while she sits (that's her "mesmerized by Disney" look). More energy consumption not in the budget. Of course (BIG MAJOR ADVICE ALERT!!!) when you were doing your original budget for the power out/power in/power storage calculations- you DID include a substantial chunk of the budget for "unanticipated needs" - didn't you? :-) Of course you did. Good for you. I did, in fact. But that was 25 years ago, and the world has changed; that margin has long been used up; so the extra load now has pushed us over our normal winter brink. Instead of running the backup generator once a week in winter, we're now having to run it about every other day. If we don't- the first thing that happens is the DSL modem drops out. Horrors! The other loss of power, stemming from the shadows of tree branches; is fairly new. Those trees only grew that tall in the last 3 years, and I hadn't really expected them to, ever. Silly me. I was basing my tree height expectations on what my farmer neighbors told me, and the observable heights of trees in farm-forests around here. Surprise- if you manage the forest for the trees- not the cows- the trees get quite a lot taller, in 30 years. Now, in December/January, because of tree growth, the solar array is actually charging the batteries for only about 3 hours a day; drastically less than the usual 5-6 hours. Thankfully, it will only be a few more weeks before the sun rises high enough in the sky so it is above the trees much earlier. Meanwhile; more gasoline. We're sighing in relief over the current drop in gas prices; but for the future, this is all a problem; the basic equations for electricity for this house are now out of balance; and unbalanceable without some serious changes in the array. No easy answers in sight. On a different but highly related note; the Little House has been approached by Nick Rosen; author of How to Live Off-Grid , for us to be one of the families he'll cover in his new book on going off-grid in the USA (first book is UK). You can find out more about him, and find lots of off-grid discussion at his website: off-grid.net. Part of his new book, though, is that he's trying to pair up the families he covers; he wants one "old-timer", and one "newbie" for each region; so he can match up expectations and realities. Sounds good to me. For those who don't know; The Little House is in SE Minnesota; if you're within 100 miles or so, I think that's likely close enough for a match; certainly our insolation and climates will be pretty similar. If you're interested - email Nick at news@off-grid.net; or you can send me a note here by making a comment. And hurry up about it- he's about to arrive in Florida and start driving; or may have started already. Can rational behavior be contagious? Hi guys; really sorry to be gone so long; coping with illness (mostly Spice), extreme winter (we hit -35°F; -19°C last night), and business time requirements. Just found a nice short one. As we rejoice here in the USA in the apparent return of non-delusional government; and even signs of rational behavior- (no, I don't believe Obama has everything figured out yet- but it's an improvement, yes?) - I was overjoyed to see this sign of rational decision making today, from the UK, via the AP newsfeed. Essentially- some retired generals in the UK have formally suggested that they should just plain scrap their nuclear weapons programs; as unnecessary. Now there is a bit of news to do a real, serious, happy-dance over. No kidding! Wow. Signs of intelligent life, after all. Gotta go get some firewood. You go do YOUR happy-dance! Ok, I must be feeling better, because here comes one of those "I just can't STAND it" posts. Wall Street starts new year with a bang! Stocks rally, with the Dow closing above 9,000 for the first time since November. NEW YORK (CNNMoney.com) -- Stocks rallied Friday, with investors starting off a new year on the right foot, after an abysmal 2008, and the Dow closing above 9,000 for the first time since November. 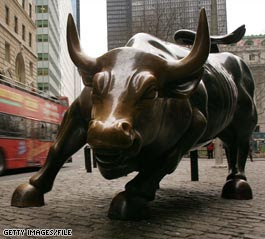 The Dow Jones industrial average (INDU) rose 258 points, or 2.9%. It was the second-best start of the year on a point basis, according to Dow Jones. On a percentage basis, it was the sixth best start of the year. The Standard & Poor's 500 (SPX) index gained 3.2% and the Nasdaq composite (COMP) rose 3.5%. "It's the classic Santa Claus rally and people don't want to miss the boat, although the volume is pretty light," said Joseph Saluzzi, co-head of equity trading at Themis Trading. According to the Stock Trader's Almanac, a combination of the last five trading days of the previous year and the first two of the next have yielded an average return of 1.5% for the S&P 500 since 1950. The S&P is up 7.3% as of Friday's close. "It's a nice start to the year, but we're not going to get too excited about it until we see a sustained advance on higher volume," said Matt King, chief investment officer at Bell Investment Advisors. Saluzzi, King and other analysts are cautiously optimistic that Wall Street will recover some in 2009. However, the extent of any market recovery will depend on a variety of factors, including what kind of economic stimulus package the new Congress approves - and the depth of the recession. Wall Street starts new year with a gib gnab! NEW YORK (CNNMoney.com) -- Stocks rallied Friday, with investors starting off a new year on the right foot, after an abysmal 2008, and the Dow closing above 9,000 for the first time since November. Pretty wonderful progress, considering that just one year ago, the Dow started the year at over 12,500. The Dow Jones industrial average (INDU) rose 258 points, or 2.9%. It was the second-best start of the year on a point basis, according to Dow Jones. On a percentage basis, it was the sixth best start of the year. Compared to the average daily trading changes over the past year, a move of 258 points is totally meaningless; the market has repeatedly been up 250 and down 250, or far more, with no trends established. The Standard & Poor's 500 (SPX) index gained 3.2% and the Nasdaq composite (COMP) rose 3.5%. Those percentages look big, compared to movements in recent years, because the total value of the market is so much lower than just one year ago- a movement of a few dollars looks much bigger now, allowing much more exciting journalism. "It's the classic Santa Claus rally and people don't want to miss the boat, although the volume is pretty light," said Joseph Saluzzi, co-head of equity trading at Themis Trading. "These 'bear trap' rallies are SO much fun to watch." someone in the room muttered, under his breath. "I'm selling short again, bigtime." According to the Stock Trader's Almanac, a combination of the last five trading days of the previous year and the first two of the next have yielded an average return of 1.5% for the S&P 500 since 1950. The S&P is up 7.3% as of Friday's close. According to the Old Farmers Almanac, a combination of the first three snowfalls of December, and the first two Santa Claus rallies of the New Year, have yielded an average return of 2.5 potatoes, and a partridge in a pear tree, since 1854. Except when it didn't. "It's a nice start to the year, but we're not going to get too excited about it until we see a sustained advance on higher volume," said Matt King, chief investment officer at Bell Investment Advisors. Mutt Queen, chief recovery officer at Dingaling Divestment Advisors, had exactly the same comment. Saluzzi, King and other analysts are cautiously optimistic that Wall Street will recover some in 2009. Thousands of other analysts are not in the least optimistic, of course, and are moving to the highlands of Borneo as fast as air transport can be arranged. The cargo cults there receive them graciously. However, the extent of any market recovery will depend on a variety of factors, including what kind of economic stimulus package the new Congress approves - and the depth of the depression. "Look, since 100% of ALL indicators from that pesky "real" economy are way past "uh-oh" and into "holyshitrunforyourlife" - it's fun to still have some fantasy nice days in the "financial sector" - before it totally disappears." said Bunny Berninny, a stripper working off-Wall Street. "You gotta get your jollies where you can these days." That's what y'all hang around here, for, right? And here we are, New Year's Day- the premier day of the year for passing good, useful wisdom around. Years ago- I was visiting my younger brother in Boulder, Colorado. It's a university town- one of the renowned party schools of the world. Tons of well-to-do elite scions floating around town, with money to spend. So of course, there's a downtown with plenty of flashy shops to soak up all the excess cash. And lots of attractions. My brother was taking me there to get some lunch in one of the many up-scale boutique nosherys; and specifically to experience the abundant buskers. It wasn't a word I was familiar with up to then- they're street performers; expecting you to put a bit in the hat after you enjoy their act. My brother told me that an extraordinary collection of wildly diverse and insanely talented buskers had also been attracted to the huge supply of loosely attached dollars- so it sounded like good fun to me. We drove to an off-main parking lot (close in was always impossible) and walked two blocks into this core area of yuppie enterprise. One block away- I stopped- and started to laugh. And I couldn't stop. I kept laughing- in various uncontrollable fashions- all the way up to the object of my amusement. And, of course, the windows were full of spiffy tools- Buddha and Ganesh statues, books on Zen stained-glass making, Druid-Sufi t-shirts, you name it. Hey, man! Don't gimme none o' that HOME-GROWED wisdom! I want me the real, EXOTIC stuff!! LOL!!!!! I am, truly, still laughing. See- in my book- genuine wisdom is; um WISDOM. And utterly priceless; wherever you can find it. Its always rare, and hard to find. And I do truly think anybody who goes looking for EXOTIC wisdom- has utterly failed to understand what wisdom is. Please understand, I'm not opposed to picking up a bit of wisdom from Buddha, Master Kong, Pliny the Elder or Younger, Mel Brooks, or any of them guys. It's just that in my experience, what they have to offer is truly no more acute than the insights to be gained from my neighbor; his grandmother, or my almost 4 year old daughter. And the proportions of wisdom to nonsense are really the same from one source to another, too. That's all I'm going to offer today- take any scrap of wisdom you can get ahold of, and hang on to it. It's about all we can do, in the days to come. oh, yeah. The buskers were great. One of them had an eidetic memory - for Zip codes. He had anyone in the audience tell him a Zip code- and he would tell you exactly where it was. Like, in a big city, the block. And he could. All except- mine, for some baffling reason. He knew minute towns of 50 people all over the US- but not mine. hm.